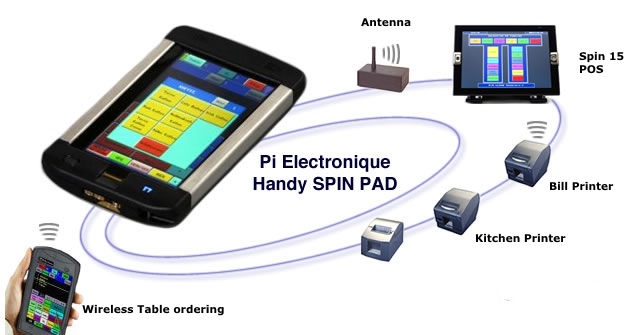 A very handy wireless tableside restaurant ordering pos system that fits into the palm of your hands. It not the size of an ipad or android tablet. And it is not PC based. Pi Electronique is unique. Its a reliable and a dependable pos system that is purpose built for restaurants. It uses proprietary hardware and software and using its RF Technology the Wireless Handy communicates seamlessly with the main pos to send orders to kitchen/bar printers. This pos system with its reliabilty is ideal for any restaurants where tableside ordering is required, inside or outside. It is very fast and “intuitive” during use, the full training takes less than one hour! The Handy system has been specially conceived for restaurant area use. It is not an “assembly” of a palm, plus a radio card, plus a battery, plus…but the whole, including antenna, is gathered in a compact box system. Its screen is 50% to 120% larger than the classical organizers, so it is easier to use: more articles in direct sales, direct view on the order, easier to read with bigger characters. Handies are directly linked to PI Electronique POS, not to PC (not windows so it’s faster and more reliable). And of course, the PI Handy has the “know-how” of PI Electronique on the hospitality business! And because there is always a “but”, Handy doesn’t know how to phone people, play games, or play music.